In the 70’s and 80’s, JG founded and supplied Dungeons and Dragons clubs in Decatur, Illinois high schools. 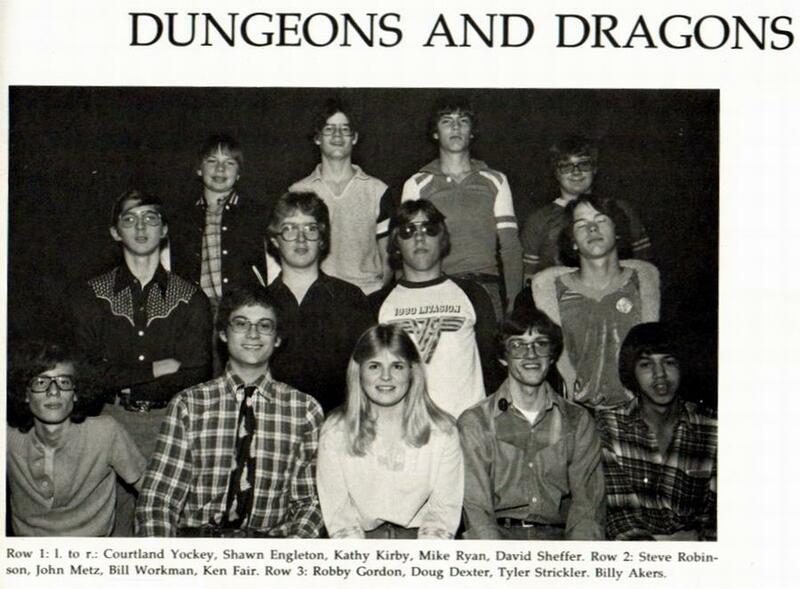 This is the 1980 MacArthur D&D Club, as pictured in the yearbook. I would pay real money for an autographed 8×10, especially if Van Halen guy signs with a silver metallic Sharpie. My crush on Kathy Kirby is immediate and all-consuming. As soon as I get my hands on a functioning flux capacitor, I’m going back in time to ask her to the prom. Judges Guild, by the way, is a fantasy game publisher founded in 1975 by Bob Bledsaw and Bill Owen. In 1976, Bledsaw and Owen got approval from Dave Arneson to create game supplements for D&D, which were successfully introduced at Gen Con IX in August of the same year. Over the next several years, Judges Guild released some 250 products—for use with D&D as well as RuneQuest, Traveller, and other notable games—and played an influential role in the formative years of tabletop RPGs. The Judges Guild website is here. On a separate but related note, I want to thank Al at Beyond the Black Gate for saying some nice things about 2 Warps to Neptune. Al is an old school gamer and game developer who has written extensively about the genre, Judges Guild included.